Airbnb meets New York Attorney General Eric Schneiderman in an Albany court Tuesday afternoon armed with economic stats, tales of hosts just barely scraping by, and a site freshly wiped of more than 2,000 NYC listings. The home-sharing company cleaned house to fight Schneiderman's characterization of Airbnb as a platform for illegal hotels. 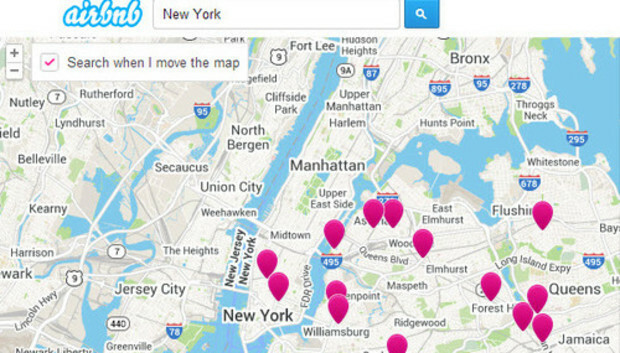 The attorney general is taking the company to court to subpoena records on every Airbnb host in New York. The company says Schneiderman is overreaching. "When we examined our community in New York, we found that some property managers weren't providing a quality, local experience to guests," Airbnb public policy head David Hantman said in a Monday blog post. "These hosts weren't making their neighborhood stronger and they weren't delivering the hospitality our guests expect and deserve...Earlier this year, we began notifying these hosts that they and their more than 2,000 listings would be permanently removed from the Airbnb community." The New York Post reported Monday that 64 percent of Airbnb listings for New York City as of Jan. 31 were considered illegal sublets under state law. Schneiderman filed an affidavit to that effect to back up his subpoena. Short-term rentals of less than 30 days aren't allowed unless the host is present. A third of the listings came from 12 percent of Airbnb's 15,000-odd hosts. One host had 80 listings, according to the affidavit--clearly not a typical New Yorker just trying to make ends meet. Airbnb claims those hosts don't represent the larger community, and have been removed anyway. "In an attempt to distract from their vast data demand on regular New Yorkers, the New York Attorney General's Office has circulated a list of Airbnb users with a large number of listings," Hantman continued. "Every host on this list that rents apartments has been notified that they and their listings will be permanently removed from Airbnb." New York law poses the greatest challenge for Airbnb's legitimacy. The company has made huge strides in cities like Portland and San Francisco, even nailing down tentative tax deals. But New York lawmakers and regulators have resisted Airbnb's attempts to make nice and seem unconcerned with the company's promises to help hosts pay taxes--a potential $21 million windfall for the state. "Not to pooh-pooh $21 million, because you and I both would think that's a lot of money, but when you take an affordable apartment off the market in New York City it costs the city to replace that unit, at minimum, $500,000," State Sen. Elizabeth Krueger, who authored the 2010 law banning short-term rentals, recently told Next City. Airbnb's tax contribution would create 42 affordable housing units, which is a drop in the NYC real estate bucket. Even if Airbnb succeeds in changing the short-term rental law to allow hosts to Airbnb their homes for a few days at a time, most apartment leases still ban sublets without landlord approval. Krueger has criticized Airbnb in the past for not letting its hosts know that they may be violating their leases by using the site, and could face eviction. "Eventually, the small group of politicians who feel they must oppose us will fall away, and New York will truly become a Shared City," Hantman wrote. "Standing together, showing the world who we are and what we stand for, we will turn the tide in New York."